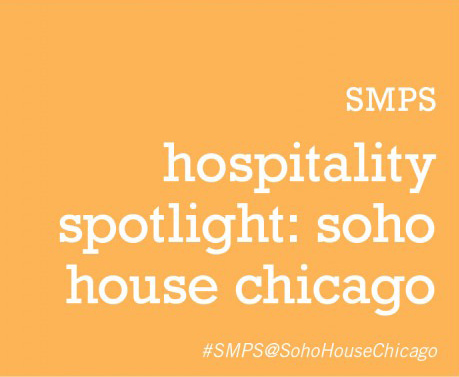 Partner Aracely Nevarez, Associate Stephen Marcus, and Interiors Associate Janice Belen will lead a tour of Soho House Chicago on Wednesday, February 11th, from 5:00-7:00 PM, as part of SMPS Chicago’s monthly networking programming. The presentation will provide an overview of the conversion of the Chicago Allis Manufacturing Corporation building at 113-125 N. Green Street into the fifth North American location of Soho House, a London-based private members club for those in creative industries. The project team will then lead guided tours of the House, with views of the rooftop deck, the fitness center and boxing ring, the cinema and a hotel room. The Society of Marketing Professional Services is a professional association dedicated to creating business opportunities in the A/E/C industry. Since 1982, the SMPS Chicago chapter has been providing networking and continuing education opportunities for marketing and business development professionals throughout the Chicagoland area. For more information about the event, visit the SMPS event page.